Nine West “Round Town” Purple Heels Size 12. Condition is Pre-owned. Shipped with USPS Priority Mail. Shoes have been resoled and still look pristine. WIDTH:3" (widest part). INSOLE:9.5" heel-to-toe. We will properly wrap every item carefully. 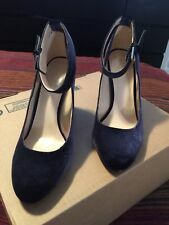 Nine West Louiza Ankle Strap Pump/Navy Velvet/4 Inch Heel — Brand New These are brand new and have never been worn. Only tried on. Unfortunately, I am closer to an 11 than a 10.5 so I’m selling these. They’re beautiful/classy and understated. The heel is sturdy and the toe box is round enough to keep them from pinching. They’ll be absolutely great this fall and for work with suits and dresses. I tried them on with skinny jeans and they were cute with those too. Please ask me any questions you might have. They feature a WINe velvet upper with wrapping ankle narrow strap. The shoes have a lightly cushioned footbed and a man-made sole with an almost 3" velvet-wrapped wedge heel. LADIES 10M. ~ NINE WEST ~. Fabulous Black Velvet Nine West Ankle heels, perfect for that little black dress you are planning to wear in your next late night date. And it's always a pleasure to serve you. This is a black pair of slip on shoes with tall chunky heels, square toes and a velvet-type fabric upper. '. Material : Fabric. Color : Black. The bottom is scratched up a bit as well as the inside of one of the heel areas but no one will see that when they're on. Velvet footbed. Wood block heels. Leather uppers (braided t-strap with buckle. ). Nine West slingback high heel shoe. black, size 10. Our goal is to provide you with a Superior Product and Excellent Service. from 10:00 AM to 5:00 PM. Nine West ankle strap velvet high heel sandals. black, size 9.5. Inventory location: shoe shelf 14(736). Our goal is to provide you with a Superior Product and Excellent Service. from 10:00 AM to 5:00 PM. Nine West Louizao Heels. Ankle Strap - Round Toe. Navy Blue Velvet. used nine west heels 11. Condition is Pre-owned. UPPER: Velvet. HEEL HEIGHT: 4". Need it fast?. Nine West shoes size 9 Kirsten **new**! Originally $80! Unique crushed velvet look heels. 3" heel. The velvet has been reglued on the heels and there is peeling on the lining...not noticeable when worn. Plz see photos. Black velour textile manmade material ~ almond toe ~ thick chunky 3.5" heel ~ lace up tie. Super cute and stylish New Nine West shoes. size 9 1/2. Bottom of shoe has a number 28 as item number. See pictures. They are used. they have a couple of scuff marks on the heels but not to big of a deal. pls see pics. thx you for looking be safe and enjoy. They are a size 9.5M, and black in color with tiny rhinestones. Nine West classy black velvet/suede dress shoe with about a 3 inch heel. Size 7.5. Very comfortable!!! Looks amazing with a cocktail dress or a pair of jeans. It is a classic high heel shoe. Happy Bidding!!!!! Nine West Black Leather Classic Heels Pumps Size 61/2M Women’s High Heels Shoes. Condition is Pre-owned. Shipped with USPS Priority Mail. Bottom of right heel is broken. Bottom soles are slightly dirty and show signs of very light wear. Length (heel to toe)-10.75". Insoles-10.75". Width-3.25". Toe of left shoe is slightly dirty. These gently worn dress shoes have satin ribbons that tie around the ankle in a bow. Genuine Nine West "Carnation" Platform Sandals. Black Velvet - Full 6" Heels! Black Velvet Uppers. We source both new and pre-owned quality shoes and accessories. We want you to be happy! Silver Buckle Ankle Strap. Block Heel. The Exterior is in Great Condition, but it shows signs of wear on the soles of the shoes. Color: Black. Material: Textile Upper / Man Made Lining / Balance Man Made. NINE WEST BLUE VELVET HEELS, EXCELLENT CONDITION. TEXTILE UPPER. COMMUNICATION IS KEY AND I AM MORE THAN HAPPY TO WORK WITH YOU AND GET THINGS WORKED OUT! These stunning red heels have a lot of pattern and texture. They are sturdy, dressy, and have never been worn. Womens Nine West Leroux Velvet Pump Size 7 1/2 Floral Design. Shipped with USPS Priority Mail. Size 10.5M. 5.5” covered heel & 2.25” platform height. MFR model: “CALLISTO”. Sorry, I have no box for these shoes. LADIES 10M. They feature a black velvet upper with rhinestone/buckle detailing and have a buckled narrow ankle-strap. The shoes have a lightly cushioned footbed and a man-made sole with a 4" velvet-wrapped heel. Bottom soles are dirty and shown signs of normal wear. Shoes are in pre-owned condition and shows signs of normal wear. Length (heel to toe)-12". Insoles -10.75". Width - 3.25". Heels and toes of both shoes show dirt/white scuffs.